Whether it’s because of family obligations, school, or work, we’ve all faced deadlines. When we have to hurry to get things done, it makes us break out into a sweat. Depending on what type of person you are, it’s a lot or a little. The worst part is that our feet are always going to sweat the most, and they just love to create a particularly noxious odor which is only going to add to our stress. If you are living a life that is full of deadlines and external pressures, then you need to make sure no one sees…or smells your sweat. While you can only wear so much deodorant, wearing these Stealth Socks will drastically reduce your foot funk while simultaneously improving your comfort levels. It uses bacteriostatic silver and activated carbon infused fibers, the latter of which we have seen crop up in some other items. These were designed to keep your tootsies easy and breezy while giving you arch support, cushioning just about every part of your feet with hexagonal padding, and an auto-adjusting non-slip cuff to make sure they stay on. They’re stylish, comfortable, breathable, and won’t be subjected to pilling or getting fuzzy like most socks. 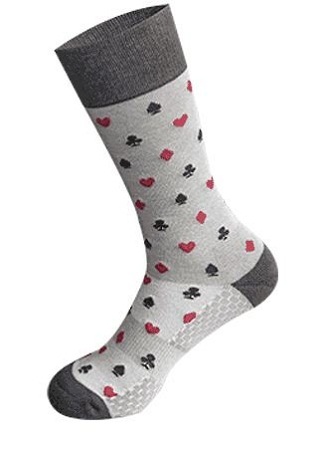 There are eight different styles to choose from, and while they are targeted at men, that doesn’t mean ladies wouldn’t get use out of these $19 socks.